The new Panigale will be even faster and lighter than the existing R model. 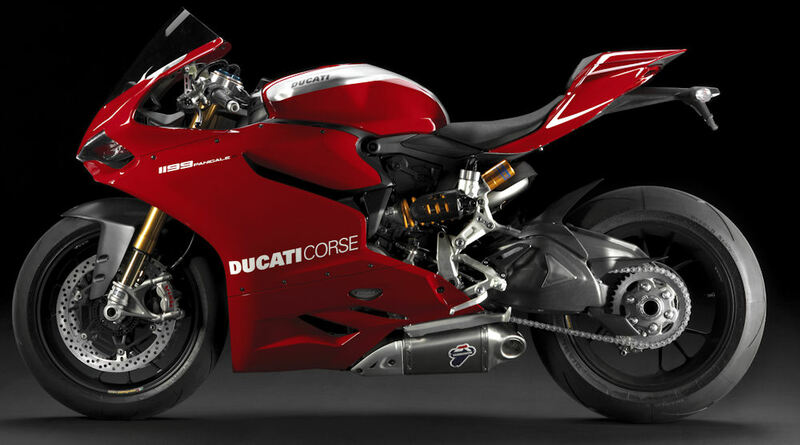 The Ducati 899 is on its way (we’ll have a review soon), but there are already rumours of another Panigale on its way. According to Asphalt and Rubber, there’s a new version of the 1199 coming, called the Ducati 1199 Panigale R Superleggera. What’s the difference between this bike and the already-impressive 1199 Panigale, the Panigale S or the Panigale R? How about shaving 40 lbs off the bike’s stock weight, due to uninhibited use of carbon-fibre and titanium parts? If the news of all that weight loss doesn’t get you hot and bothered, the rumours also have the Panigale gaining a lot more power. The standard 1199 motor puts out an impressive 195 hp, and the hot-rodded R version supposedly makes 205 hp. The new Superleggera one-ups all that by supposedly making 220 hp. Supposedly, the machine will also feature the latest and greatest electronics package, including anti-wheelie software, as well as top-notch suspension (Ohlins) and braking components (Brembo). Best of all? You might want one, but you can’t buy one, most likely. If the rumours or true, these bikes are going to have a very limited production; only 500 will be made, and you’ll only be able to buy one if Ducati sends you a secret code. That’s right, it’s Willy Wonka-style marketing, but with motorcycles. Only pre-selected buyers will be able to lay their money down on these bikes, as they’ll never be available right off the dealership floor. Heads up for you boys, there is no secret code for buying one of these. Ducati has typically rewarded their clients’ loyalty by providing them with preferential treatment when new, limited edition bikes are released. As an example, if you have previously purchased an “R” model bike you may find yourself on the short list for this new one.